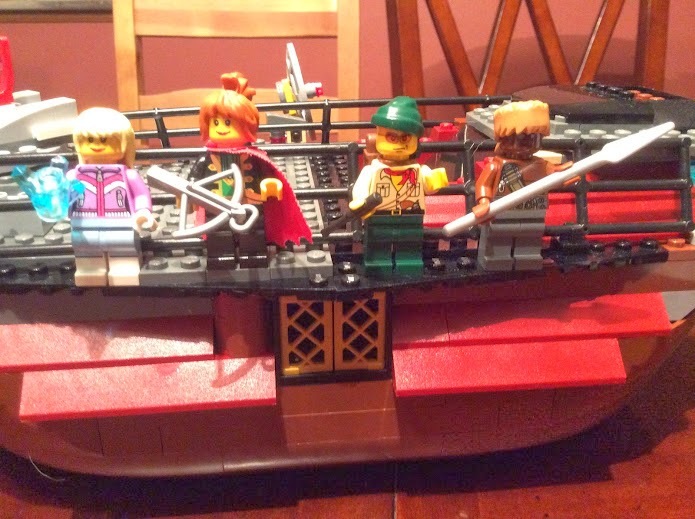 Elsa, Anna, Milo, and Tonto in Lego form! A billion years beyond "once upon a time" the Silver Comet was gliding across the waves, heading south for the coast of Ancuan. Commodore Jek Sperro was assisting Merida in piloting the craft, which was towing the pirate's cyphic vessel, the White Onyx. The craft was making excellent time, and just a few hours prior they picked up a few hitchhikers who were on a deserted beach: Milo and Tonto! Always eager to help out some friends, Elsa and Anna helped the two onto the craft and continued their voyage. When a storm arose on the horizon, however, the team became mighty fearful. Five waterspouts appeared almost out of nowhere, forcing the Three Princesses of Nihliesh to turn the craft quickly and see if there was a way around the storm. Sensing something amiss in the water, Elsa took some rope and climbed down to the water. To her horror, she saw that there was a strange creature floating just off the starboard side of the craft. It looked like a bunch of eels, an octopus, and a crocodile merged into one unified creation. Riding atop this "thing" was Mr. Smee! We're calling Ursula a "Crockosnaketapus!" The octopus looked dwarfed by the much large creature it was sitting upon. Mr. Smee told the party that the hybrid creature he was with was Ursula the Sea-Nano, the most powerful science-sorcerer of the seas! Ursula was the mother of the Kinkrak the party defeated, and was also Mr. Smee's second cousin, and so she was out for revenge. It was obvious that Ursula was creating the storm, but when this had no effect on the amazing ship faring skills of the princesses, she turned her tentacles and cyphers to the water itself. Aerating the water excessively, the bubbles created a dreaded "suction", dragging the heavy dagger-craft below the waves. Although they would've preferred to stay and fight, when Commodore Jek Sperro bolted into the Silver Comet, the rest of the team followed suit and battened down the airlocks. Slowly the dagger-craft sunk, over a hundred feet to the bottom of the waves. While the party had no idea what was going on topside, they soon realized that they were in quite the pickle. Even though the Silver Comet had many amazing features, it was still a discovery, a craft with many strange and mysterious workings that no one understood completely. Milo was able to connect with the craft using his special talents, and figured that the Comet could't operate without exposure to air. 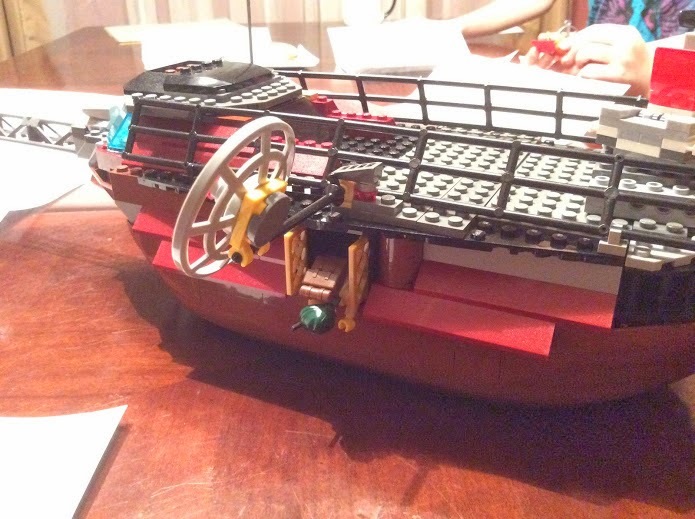 It may have been air-tight, but it certainly wasn't a Red-Fleet submergine! At least he could connect somehow with the White Onyx. First Milo operated the grappling hook on top of the craft to dig into the ground and then drag the entire ship closer to the submersible. Once near enough that the swim from one craft to the other wouldn't be too daunting, Milo opened the energy door on the submersible remotely using his brain, and then the party opened the airlock door. While water rushed in Milo struggled to get out, and then the door was closed behind him. Swimming over to the Onyx, Milo got the craft running. He was soon joined by Elsa, who followed not far behind him, and the two piloted the vessel, with the Silver Comet in tow, to the surface. Once the Silver Comet was above the waves her engines started back up again and power coursed through the vessel's engineering section. But Ursula the Sea Nano was still there, and she seemed quite angry that the party had manage to escape from her trap! Quickly Ursula "split up", with two of the strange "eelagators" breaking off from her body while the writing smaller eels stretched out elongating her tentacles. 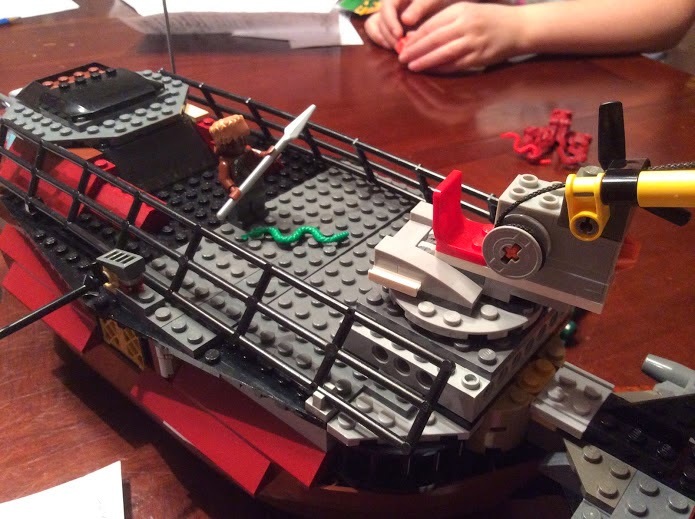 To defend their ship, Tonto and Anna rushed to the deck and took up defensive positions. Ursula "fired" one of her eel-tentacles onto the deck, an attack similar to what her Kinkrak son could do. But these tentacles seemed much easier to defeat at first, and Tonto speared it to death with one blow. The two eelagators were trying to climb the sides of the vessel, but Anna used her crossbow to shoot one, and knock it back into the water. Not wanting to stay out of the fight, Elsa took control of the sonic cannon on board the White Onyx. She fired a direct shot on Ursula, with a shockwave washing over the two eelagators that were half in the water still. While Ursula tried desperately to regain her senses, Milo drove the White Onyx at full speed straight at the Sea Nano, hoping to ram her but missing. On board the Silver Comet both Anna and Tonto were feeling pretty good about their chances in this battle! But the eelagators were coming! But then the course of the battle shifted. Tonto would strike one of the eelagators with his spear, trying to keep it from boarding, but when his weapon touched the beast, he too was injured as electricity coursed through his body. Then Ursula regained her ability to attack she fired another eel onto the deck. This creature struck Tonto, impairing his ability to fight severely. Soon both eelagators were climbing onto the deck, and the battle became more desperate. In the waves, Elsa prepared for a finishing blow with the sonic cannon, but the weapon backfired destroying the White Onyx, which started to sink. About the same time that one of the eelagators dragged an incapacitated Tonto into the waters below, Elsa and Milo abandoned ship. 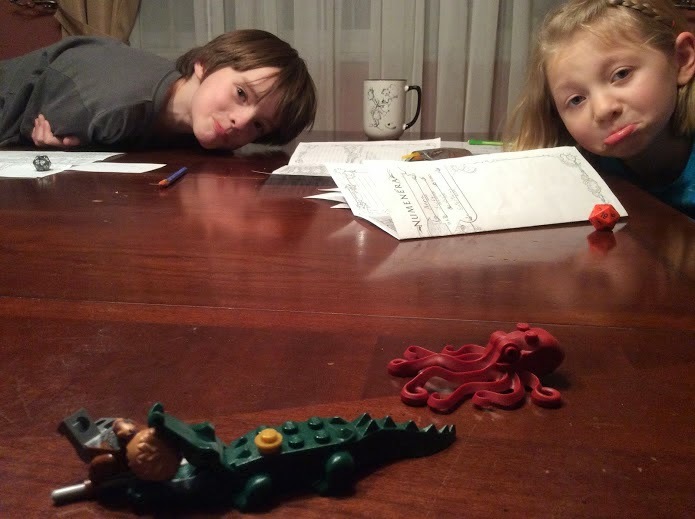 Elsa swam towards Ursula to have a nano-versus-nano encounter while Milo saved Tonto with the help of Commodore Jek Sperro and the grappling arm. Anna was able to finish off both of the eelagators with her crossbow, and managed to successfully dodge their jaws. 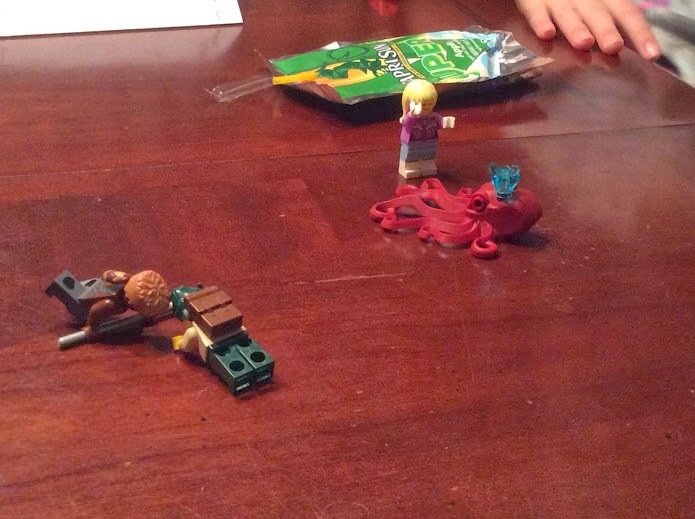 The nano battle was luckily one-sided, with Elsa's powers winning out over the evil octopus's. Knowing that she had been defeated Ursula tried swimming out to sea. 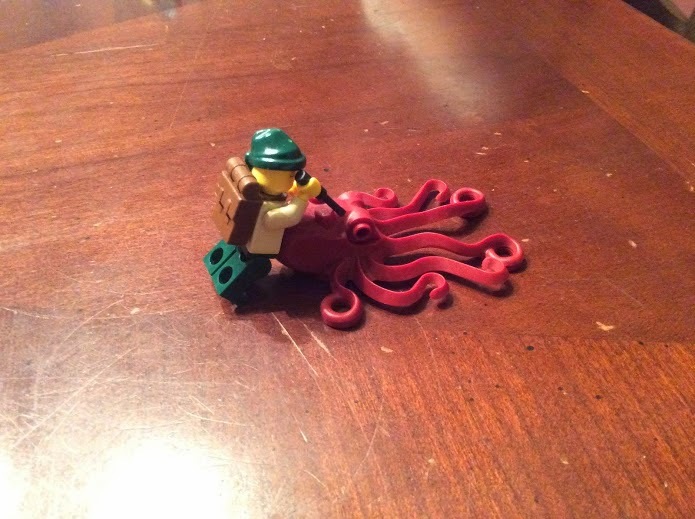 But Milo was a fast swimmer himself, and since the octopus was injured he was able to catch up to her and shank her in the back with his dagger. Everyone got back aboard the Silver Comet and the party celebrated with some hot chocolate and waffles. Milo saves Tonto while Elsa tells Ursula to chill out! "Crockosnaketapus!" 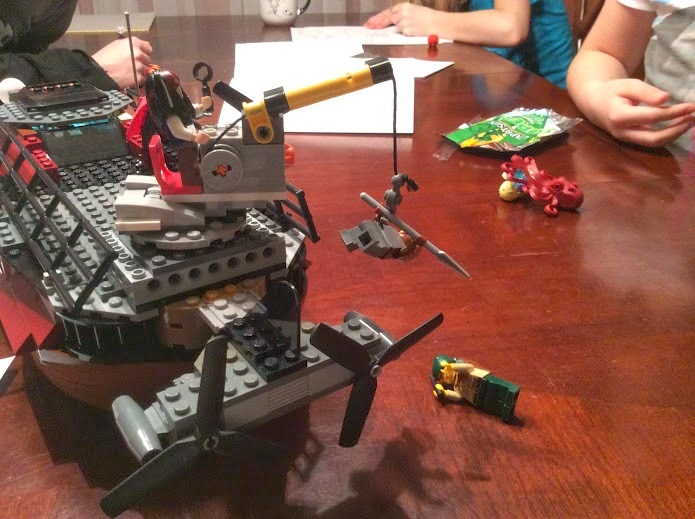 - Craig was flabbergasted by the GM's Lego creation. Dylan: "If we are underwater, wouldn't the pressure crush the glass and…"
GM: "You're not that deep underwater"
"Wait, that isn't a 2! It's a 20!" - Carrie tried to shift Dylan's die roll in a rather obvious fashion. "I'll pay for it… I'm a princess." - Elsa to Milo after blowing a whole in the White Onyx with the ship's sonic cannon. *SPOILER ALERT* - If you haven't played The Devil's Spine yet, but plan to as a PC, please DO NOT READ this blog! The room was large, full of bottles, tanks, pipes, and other containers that housed chemicals and various juices of unknown varieties. But these strange devices, as odd and mysterious as they were, were of little import to our brave and somewhat desperate band of numenera hunters. For at the center of this large and dark room was a gargantuan coiled serpent, Devola the Nagaina Matron, who asked the four intruders the reason for their trespassing, despite already knowing the answer. The party’s clever jack who had a tendency to ride electrical currents was afflicted by an enormous parasite, presumably one of Devola’s young, that would eventually kill him. It was the hope of the party that Devola would make a deal, that she would somehow assist the party if they had something to offer her in return, for it was rumored by the Lily, a stone construct they had met earlier, that the Nagaina Matron was prone to making deals. At first the party searched through their oddities. They had fireflies in bottles, and a mirror that showed the user a picture of his or her father, but none of these even sparked an interest from Devola. They moved on briefly to their cyphers, but when the serpent-worm took a look at the party’s gear, it scoffed at this as well. It was clear there was nothing that they could offer in direct trade, but Devola mentioned that perhaps the numenera hunters could perform a task to gain her assistance. The nagaina matron was clear that even though she could not remove the parasite now, she could do so with the proper materials. She would require a chemical known as gharolan to allow her “patient” to live through a medical procedure that could be performed with the Impossible Blade. Neither the chemical nor the blade were in her possession. She knew that the gharolan was located near deep sea thermal vents, and told the party that they could meet with a man named Cagyn in Harmouth who could assist them in it’s finding. As to the blade, she could only give a description. Help with this surgery, as she reminded the team, would only come after they completed their end of the deal. There was an intelligent “virus” known as the Insidious Choir that “infested” a portion of the Back Riage south of Uxphon. This awakened and intelligent virus was a threat to all life, as it had found a means to create giant walking colonies the size of men or larger, as well as communicate with other virons of it’s own kind through a transmitting tower. Although Devola seriously doubted the party’s ability to eradicate the virus completely, she tasked them with knocking out the communication tower. Hoping to garner some further assistance Torrent tried sweet talking Devola but had little success. So Oswin the mechanical woman moved in and used her own sciency words to try and appeal to the beautiful mind of the female serpent-worm. 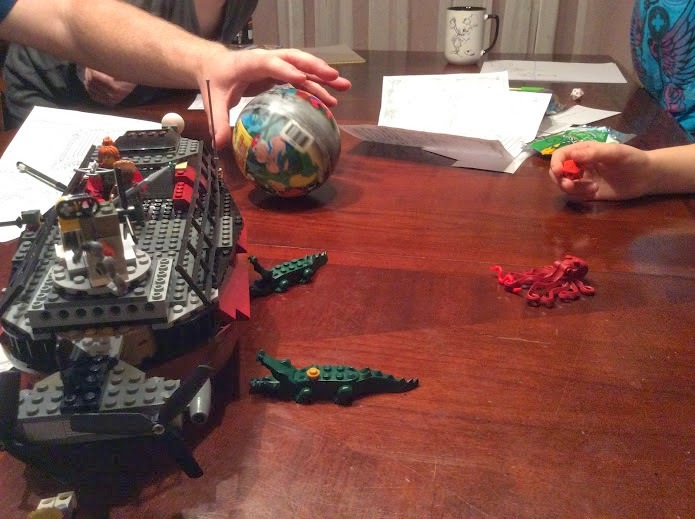 While the rest of the team looked on in abject horror, Oswin’s flirtations somehow appealed to the creature, and she began offering various things to aid the numenera hunters in their task. First she told them of a station where a great shackled beast could quickly transport them to the part of the Black Riage where the Insidious Choir’s communication tower was located. Next Oswin talked Devola into handing over some choice artifacts and cyphers. When Oswin’s emotional probing was finished, Devola offered an inoculation against the virus, which each of the party happily accepted. The nagaina matron bid the party adieu, and told them not to return until they had completed their tasks against the Insidious Choir and acquired the Gharolan and Impossible Blade. The path to the “station” that housed the shackled beast was easy enough to follow. The team of numenera hunters wanted to move quickly so that they could make good time as they only had a few months until Torrent would fall to the parasite defender, and for science’s sake no one knew how long their three missions would last. The path eventually led to a large metal door. Silus passed her head through the door, saw that there was a dimly lit “train station” on the opposite side, and set the boys to task opening the door. Although the door gave Lynq a little trouble, with the help of Torrent he was able to force it open. This led to a large open chamber, just over 120 feet from top to bottom, with a “train” located at the center. Torrent, Silus, and Oswin were limited in what they could see, just barely making out the features of the area, but for Lynq’s darkvision he could see just about everything as if it were broad daylight. There was a control panel of sorts to the left of the platform on which the party was standing upon. Silus ran her fingers across some braille-like bumps and received images in her head of the craft’s operation. Called the Catena, this craft would start moving as soon as three levers were disengaged, each corresponding to one of the clamps holding the craft in place. The craft would begin to move as soon as the third clamp was disconnected, so the team would have to be ready to go once this happened. So the challenge was to find all three levers in this area. Luckily for the party, which was relying on glowglobes and ambient light from some of the nearby machinery, Lynq’s tendency to explore dark places came in quite handy as he could see everything in this area as if it were broad daylight. He easily saw the first lever through the metal grating thirty feet above the party’s head on a raised platform. Silus put her magnetic boot cyphers on and climbed the wall until she reached the platform. When she moved towards the lever, however, she found her faced snagged by a razor-sharp metallic strand that was attached to the floor and stretched to the ceiling. Lynq climbed up, aided by a rope Silus tossed down, and was able to see four of the strands, each dangerously encircling the area. Using his unbreakable shield Lynq severed all of the strands. Figuring that this would be the easiest lever to move, they left this and continued their search. Oswin was particularly interested in the Catena itself. The party found that the access panels in the roof of each Catena-car were easy to open, and the team explored the craft car by car. While most of the cars were simply for passengers, containing dusty yet comfortable couches, the front-most car had an automatic control system that Oswin was able to access with her “plug-and-play” internal wiring. Navigating the system’s dormant controls, Oswin figured out a way to end the Catena’s autopilot system, so when the third lever was activated, the craft would not automatically travel off on its own. When the rest of the crew decided to leave the Catena and look for the other two levers, Oswin chose to stay behind and lounge in the craft. There were access points to an area below the Catena, and since the other two levers didn’t seem anywhere to be found Lynq led the team down a ladder into the lower level. Strands of silvery metal were all about down in the dusty chamber, and Lynq continued to cut each strand using his shield’s edge, right up to the lever itself. But that last strand that was cut didn’t pop the same way as the others, and may have been attached to something different than the others. It wasn’t but a few moments after the lever was pulled that the steel spiders appeared! 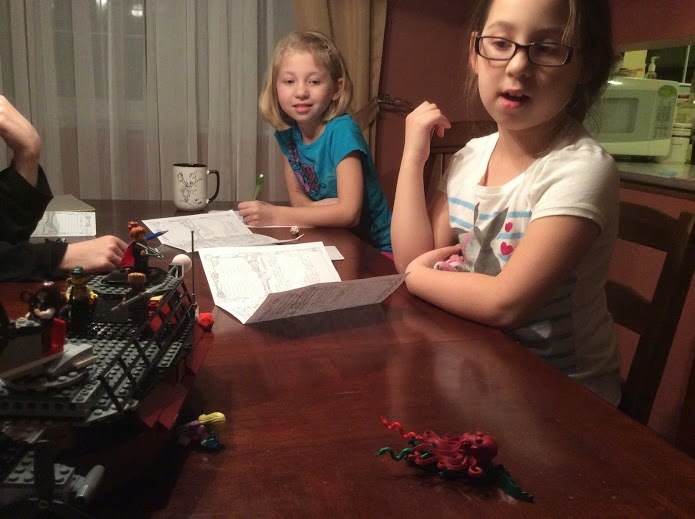 Four of the creatures came up from a chamber below the lower-level, charging the party. Lynq’s radiance blade was quickly unsheathed, Torrent unleashed his beam lance, and Silus pulled her crank crossbow. Lynq was able to drop one before it reached them, and the beam lance and crossbow proved effective, albeit somewhat limited due to the tough armor of the spiders. When the attack came, Torrent and Silus were able to dodge the metal mandibles, but Lynq wasn’t so lucky. The nasty bite from the spider injected metal into his veins, causing excruciating pain and agony. The remaining spiders were no threat to the team, although Oswin’s help would’ve been great. Torrent injected an antivenom into Lynq’s arm which helped with some of the discomfort. The party found the last lever in the sub-basement area, but it was surrounded by metal threads. Using the magnetic boots, which were still active for a few minutes more, Silus climbed into the chamber carefully and activated the lever. Lynq would climb up to the last lever while Silus and Torrent boarded the train, and once all three clamps were disengaged the party was on it’s way to a visit with the Insidious Choir! “Do you really want the baby on his back, on his back? Do you want you baby back, baby back, baby back?” - Oswin was starting to get sassy with Devola the Nagaina Matron. “Weren’t you the one who got us shot at last time?” - Sarah wanted to remind Jen where her antics got the group in previous encounters. “It’s a Pegasus!” - Tom was fairly excited as to what sort of beast of transportation awaited them at the underground station. “You gonna give me some sugar before I leave?” - Oswin’s sass turned to full on flirting as she began to ‘come on’ to Devola. “I’m starting to think that we should vote Oswin off the island.” - Sarah to the group regarding Jen... again. “You just one up’d me!” - Lynq after watching Torrent go nuts with his beam lance. Amanda Plinkett had a problem. Her farmhouse located about twenty or so miles from downtown Dodge city had been in the Plinkett family for years. When her husband died while prospecting up in Deadwood, Amanda and her three children returned to Kansas to start their life anew on the farm that her uncle had left her in a will. Every morning Amanda cared for the animals, and helped manage both the busy life of a homemaker as well as the rigors of operating a farming operation. It was a tough life but it was improving, day by day. But one morning, when Amanda awoke from a well-deserved slumber, she looked into her fields and noticed something quite peculiar. At some point in the evening a three story townhouse erupted from the ground right in the middle of one of her cornfields. To cause more of a stir, this townhouse just happened to make low groaning noises and emit strange odors. Ghost, a Paranormal Investigator from Dodge City took on Amanda's plight with a small posse of teammates and hangers-on that bore skills capable of aiding just this kind of investigation. The Padre was a Catholic Priest who just happened to be quite handy with a knife. Pedro was a Muckraker, a pesky journalist looking to make a name for himself in the West. Mademoiselle Magdalena was a Mambo, a female Voodoo practitioner who feared nothing and chewed a cigar. Carlos the Mad Scientist packed up his giant glue blaster and left his lab to give his friend Ghost a hand, and didn't notice that the local Kid Luna decided to tag along as well. The six investigators began their investigation by searching the front door. Carlos used his supernatural goggles to check the house but was almost blinded when he realized that the entire house was supernatural in some way. Pedro and Ghost checked the handle and lock to see if they could just enter. The door handle was warm and moist with some kind of greasy liquid and the keyhole appeared to be covered over by some kind of skin-like membrane. Observing the rest of the door, even the hinges looked "off", as they had just been solid blocks of brass rather than joints capable of moving. This door was not designed to open. The windows on the front and back of the house were opaque and seemed to be made of some kind of sturdy material that would not break or shatter… but it wasn't glass. When the door wouldn't open by conventional techniques, and the brute force of Pedro wasn't effective [the character had a d4 Strength], Ghost's curiosity got the better of her and she blasted away at one of the hinges with her LeMat. The shard of the hinge that broke away was not brass, but looked more like a piece of a shell. Luna tried her axe on the door, but only succeeded in breaking the head away from the shaft. Something strange was going on with this house… and then the voice started. It was a cry for help by a young child from within the home. The voice said he wanted to leave, that he snuck in the house through an open third story window, and he was injured and couldn't move. Pedro stepped back and put a bullet through the front door, hoping to blast his way through, but when he looked inside the exceptionally tiny hole that his gun created all he saw was darkness and he smelled a sickeningly sweet smell of decay coming from within. Needing another way in, especially if they were going to rescue whoever was trapped inside, the party circled the house until they found that the 3rd story window was in fact open. Please note reader that it was the only window in the entire house that was open, and so the party accepted that they just had to enter through that particular portal. Borrowing a ladder from Ms. Plinkett, Pedro set up the 20 foot ladder only to reach the second story, but the party was also able to borrow some rope. Luna passed the rope through the axe-head that she still had and made a makeshift grappling hook that helped get the party up and over the ledge. This third floor room had a stairwell down to the second story, a gambling table, a bear skin rug, and a pair of lanterns that weren't lit. Ghost went to light one of these, but there, but there were no wicks or oil. Strange. It was very dark in the room below so The Padre pulled out his cross and called upon a blessed light to cast away the darkness. Glancing downstairs to the next room it appeared to be a bedroom. While the Padre illuminated the next chamber, Luna the Kid tried to climb down the stairs. But halfway down one of the steps just happened to disappear, causing Luna to fall down end over end and injure her arm. The rest of the party came downstairs into the next chamber, which was in fact a bedroom with a doorway to the south that lacked any kind of door. Luna's arm was badly injured, and even with his blessed might, The Padre was not able to heal the damage done by the stairwell. Pedro looked through the doorless doorway and saw a long hallway with a red carpet on the floor. At the end of the hallway as another open doorway without a door, but to the left was a closed door. Moving up to the closed door Pedro noticed that the door was just ajar. But as he started to open the door it began to fight back! The door pushed against Pedro with incredible force. But the rest of the team came to his rescue and helped force the door open long enough for Carlos the Mad Scientist to pull out his glue gun (which looked like something out of a Ghostbusters movie), and spray down the entire door, entangling it with stickiness. This particular room consisted of another bedroom with another stairwell going down. It was humid and there was a heat in the air that was unnatural. The Padre and Ghost went to the end of the hallway and saw another window that was quite opaque and made of strange material. There was a barrel in a small storage chamber along with a few crates. The barrel appeared to be full of bile, and it let off a horrific stench that filled the room. At the end of the storage room were the crates, and while one appeared to be false, with no way to open it, when Ghost reached her hand into another, she found a loose organ. It was a stomach, possibly of a human, that appeared to be turned inside-out. Horrified Ghost scampered back and away, but the inspirational words of the Padre kept her fear abated. When they returned to the bedroom that Pedro had found, a noise came from down the stairs. It was the voice of the child! It was calling out for the party to come downstairs. Despite being curious, Ghost looked down and told the voice to make itself seen. From the side of the stairwell a pair of hands appeared, and looked as if they were desperately trying to pull the rest of the body forward, but the face could not be seen. It continued to call for help, and said it was stuck and couldn't move. Luna carefully snuck down the stairs so that the person attached to the voice wouldn't be able to see her and she was successful in her attempts to be stealthy. That was until she saw that the lower floor of the house… was ALIVE! The floor of this chamber was covered in a pink tissue, and had both some give and a slight coating of mucous. There were eight bodies attached to the floor, including the child's, each one appearing to be one with the floor. Horrified, Luna couldn't move. Pedro went down the stairs to see the same sight, and the child turned it's head around for a complete 180 to face the Muckraker. "Help me!" And then the bodies all started to move as the flesh on the outside peeled away allowing the skeletons to pull up and away. From each body a deadly and vicious skeleton appeared, and they slowly moved towards the party. Knowing that he had to act quickly, Carlos kicked his glue gun into overdrive and started climbing down the stairs. But the house was now fighting back, and the stairs all turned flat, creating a sliding board. But Carlos was quick and agile, and caught himself as he fell, stood up, and started spraying glue all over the skeletons. While Pedro and the Padre started shooting pistols into the fray, Ghost decided to do some cooking. The Paranormal Investigator slid down the stairs and tossed her oil and lantern into the room, lighting up both the skeletons, but also the glue that covered the room. An inferno was created and the posse knew that they had to get out, and get out fast. The home was shaking and moving at this point, making it difficult for the team to move about in any capacity. Luna climbed back up the flat staircase and lowered her satchel to help the other party members climb up. But due to her oil attack, Ghost became the prime target of the house, and the membrane below her feet started to pull her down into the floor itself. Ghost shot her shotgun into the floor to no effect, and was almost resigned to be digested by the home when Pedro pulled the trigger of his pistol twice, blasting the floor below the investigator into slimy and bloody bits. Ghost was free and came upstairs. Luna was now back to the central hallway, but saw that the carpet was now covering the doorway that had previously lacked any kind of door. She pulled her knife and chopped away at the carpet, but she couldn't get through. When the rest of the party appeared by her side, they each started firing away with their guns cutting a hole in the carpet in which Luna was able to dive through. The house continued to shake, and the party kept moving. The Padre climbed up the last stairwell to the third floor without problem, but found himself face to face with the bear-skin rug at the top of the building, which was now animated! The house was using everything in it's arsenal to strike at the posse, and this bear was a beast! It's claws crippled the Padre, tearing at his flesh and rending his skin from his bones. The priest just barely kept himself from falling unconscious and started pulling his knife while the other teammates tried their tactics. Luna tried gagging the beast with her satchel, but it was just too strong. Bullets were somewhat effective, but when the team realized they were running out of time, the Padre turned back to the bear and using his knife, cut the arm off the construct and sliced through it's neck in one stroke. How a priest had that skill no one in the team knew! But they had no time to consider the Padre's past, as it was clear that the house was sinking into the ground. Quickly Luna, Carlos, and Mademoiselle Magdalena jumped through the window, which was now adjacent to the ground despite being the third floor of the home. The Padre thought about staying behind at first with Ghost who was looking to continue her exploration but even he darted out the window just in time. Pedro wasn't far behind the Padre, and he continued to call for Ghost, who turned around and jumped but at the very last minute. She was almost stuck too, as her first leap only landed her half in and half out of the house, but with one last pull, and the aid of the rest of the team, Ghost the Paranormal Investigator was yanked from certain death. A billion years beyond "once upon a time" and the festivities at Nemo's were finished. With Mr. Gibbs, the cat-faced navigator, agreeing to return to Commodore Jek Sperro's employ, the Three Princesses of Nihliesh prepared to depart for the Sea of Secrets far to the south. With the commodore's cypheric submersible dive vessel still nestled far below the waves just below the docks, the princesses had hoped that they would be able to enter their craft and get out of the City of Bridges quietly without the dastardly Captain Rook chasing them down. Early in the day Elsa and Merida had both seriously embarrassed the pirates at the sing-off. Harboring Captain Rook's known enemy, Commodore Jek Sperro also didn't help the situation much. At the docks all three princesses jumped into the water and swam down to the submergine with the commodore and navigator not far behind. Unfortunately for the crew of the White Onyx, the submersible was not far into open waters before it experienced a significant jostle. Using the periscope, Elsa saw that Captain Rook's dagger, the Hook, had not only intercepted the White Onyx, it had also grabbed it with a magnetic clasp held on a long boom. The evil Captain Rook was fishing for a certain commodore and three meddling princesses, and it appeared that he had found quite a catch! Quickly Anna grabbed the controls for the sonic emitter and made an attempt to blast the boom and free the White Onyx, but it was to no avail. The shot was wide, and with the amount of shaking the craft was now doing, there was no way to aim again. The submergine was plucked directly out of the water and placed on the deck of the Hook. Not content with being a captive of Captain Rook, Merida decided to take the fight to the villains. The Hook was manned by only the captain and Mr. Smee, an octopus from far beneath the waves. The rest of the Hook ran itself. Merida pulled her Mephitic Staff from the storage compartment on the White Onyx and pointed it towards Captain Room and Mr. Smee, blasting them with a horrible smell. While the two were stunned and incapable of doing anything of significance both Elsa and Anna bull rushed them. 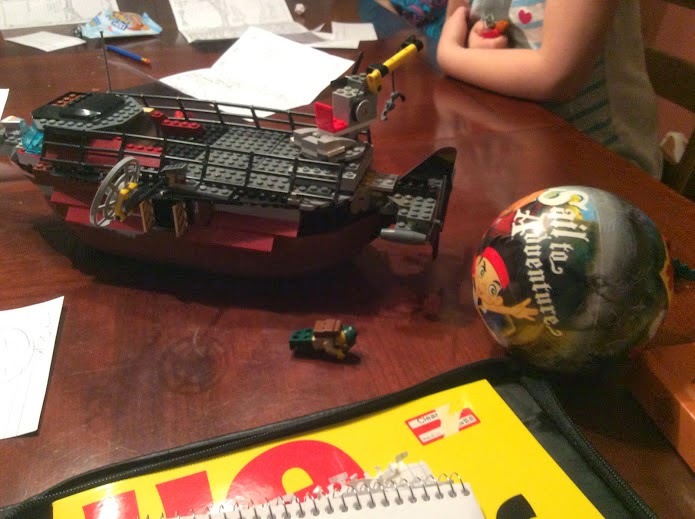 Elsa successfully knocked Captain Rook into the waves on one side of the vessel, and Anna grabbed Mr. Smee and swung him around like a bola above her head before lobbing him far across the water. Looking at each other, the princesses all high fived each other and gazed upon Captain Rook's fine vessel. It was theirs, they thought, the princesses were now corsairs of the sea! But their excitement was short lived. Soon a low groan shook the Hook, the vibrations rumbling through the princesses' feet. Off the starboard side of the Hook a large white squid appeared at the top of the waves, and on top of it was Captain Rook and Mr. Smee. It was the Kinkrak! The legendary beast that was related to Mr. Smee (probably a second cousin) that was often used as the pirates' muscle when things went awry. 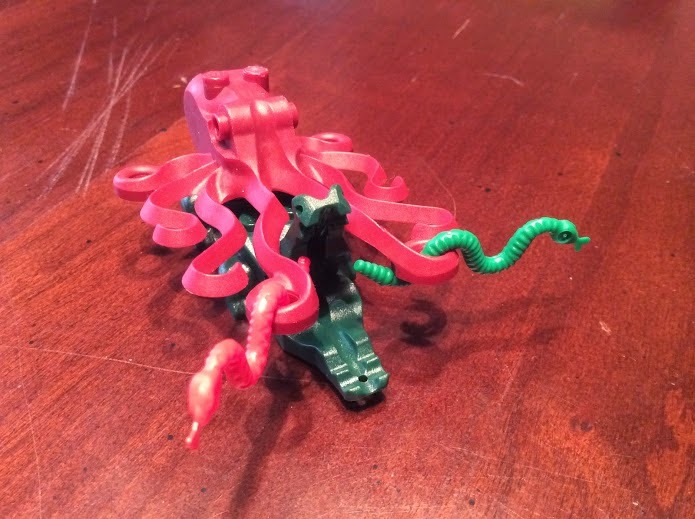 The Kinkrak had the disgusting ability to launch all eight of it's tentacles at the Hook, each one landing on the deck so the they could lash out at the princesses, fighting as eight foot long giant white worms. Elsa, Anna, and Merida closed together into a defensive circle and started firing at the tentacles closing in on the trio. Elsa first bestowed the powers of ice on Merida's bow and then started her own onslaughts, freezing one tentacle and severely frost-burning another. Merida's frigid arrows were extremely effective against the tentacles, as were Anna's quarrels. Although the slippery white things successfully got a lash in here and there against the princesses, their strikes weren't terribly effective agains their armored opponents. Merida was clad in a strong chain hauberk, and both Elsa and Anna were surrounded by esoteric mists of ice and music respectively. Although it was slow going, the Three Princesses of Nihliesh eventually left the rest of the tentacles dead on the deck. Captain Rook and Mr. Smee both looked aghast at the tremendous power of their foes, and were about to swim off on their tentacle-less squid when they came under heavy fire and were eventually knocked back into the waves. The Three Princesses of Nihliesh don't take prisoners. - "Last game you had the sing-off." - The GM describing last week's events. - "Was Nick Lachey there?" - The GM's wife being a smart-aleck. "I saw we abandon ship and walk the plank!" - Carrie was really getting into the whole pirate thing, even if it meant her character's demise. - Signature Weapon: Nigel carries an Elephant Gun… everywhere. It was early into the evening, and Lady Thana, Reginald, Nigel, Fang, and the Captain were perched on a cliffside, at least fifty feet above the jungle floor. Below them was the neanderthal-ogre encampment, a collection of tents that formed a semi-circle around an entrance to a cave. At the center was a large bonfire and patrolling the area were three male ogres. The party had reconnoitered the area earlier in the day, and began their stakeout early in the morning, so they had a pretty good idea of what to expect below. At least seven ogres lived in this camp, each one as large and dangerous as the to they fought the previous day. The brave inquisitives promised Ka of the cat-men that they would return with “the book”, a tome of great importance to the feline humanoids, and when it was finally dark masque movement Fangzhi’s plan was put into effect. First the wudang initiate was lowered down to the cave entrance on a rope, held by Captain Chance and Nigel. When he reached the entrance, Fang peered in and saw crudely made stone spears perched against a wall directly across from large barrels full of liquid. These barrels were each marked “S.S. Stag”. Fangzhi was pulled back up, shared his findings with the team, and then climbed back down and into the cave entrance. When he reached the spears, Fang tied string to the spears and started unspooling it as he moved further and further into the cave. His first expectation was that he would find a simple area possibly containing the book, however when Fang realized that natural walls of the cave soon led to the smooth stone of an underground temple structure, he realized that he may have gotten in over his head. The path led to an intersection. To his left were a pair of ogre women drying meat in an old temple chamber. To his right was a path that forked southwest and southeast, and Fang heard laughter and other sounds emanating from the latter. Directly across from Fangzhi an old and dusty passage remained, which looked as if it had not been used in quite some time, possibly due to it’s size restricting the access of the ogres. Fang decided to dart quickly into the dusty and web-covered portal only to slip at the end of his run and fall down ten feet into a pool of water. Fang had been tightly holding on to the string that he unspooled as he moved throughout the chambers, and so his fall pulled the spears down in a loud clatter against the opposing cave wall. This disturbed the ogres on the outside of the cave, so one came in to investigate, but didn’t find anything distressing. While this happened, Lady Thana teleported into the jungle with some of the trash from the troupe’s excursion, rattled a few cans together, and then teleported back to the party’s cliffside hideout, leaving the trash behind. This caused two of the ogres to investigate the trash pile, and occupy them long enough for vampiric noble, Captain Chance, and Nigel to each climb down into the tents below and begin looking for clues and evidence of the missing book. Reginald Thistlethorpe decided to wait far above the encampment, where he could keep an eye on the events occurring. Meanwhile inside the caves, Fangzhi had a heck of a time trying to keep from drowning in the fast moving water. Rather than a single stagnant pool, the water was a quick moving underground stream that flowed from an opening in the south towards an opening in the north. Although not adept at swimming, Fang’s doggy-paddling skills learned when the airship first crashed several days prior came back into use as the wudang initiate managed to make it back to the edge of the water and climb up towards the opening in the cobweb covered passage. In the tents, the party found very little that aided their quest for the book. The first tent they searched contained crude bedding, and bits and pieces of assorted finery, jewelry, and other knick-knacks possibly salvaged from visitors to the island chain. Nigel and Lady Thana were careful when they crawled under the canvas to each tent, and with good reason as the second tent contained a basic crib and a five foot long ogre-child who was fast asleep. With nothing else in that particular tent the duo moved back outside meeting up with Captain Chance. Needing a distraction, Nigel picked up a large stone and threw it to to the opposite side of the camp which drew the guard away from the cave entrance. Quickly all three bolted into the cave so that they could meet hopefully meet up with Fang. Once they were all relatively close to each other, Captain Chance ran over to hide with Fangzhi while Lady Thana and Nigel explored the southwest passage. They would uncover three chambers, each covered in a slightly fluorescent moss only detectable which they never would have seen without Lady Thana’s vampiric darkvision. The long-dead ogre in the southernmost chamber was an indication that the moss was possibly dangerous, so Lady Thana and Nigel decided to leave the area well enough alone. Captain Chance was having greater luck in his investigation of the underwater stream. Since he was the only one in the team to have any skill in swimming, the Captain swam upstream until he reached another pocket of air. Fortunately for Captain Chance this pocket actually extended ten feet above, but the walls of which were caked in foul materials such as trash, old decaying food, and excrement. It appeared that the good captain found the ogre’s crapper! But in a positive light, the noises above seemed to not just be of an ogre-ish nature. The captain listened carefully and could hear a soft british accent and someone speaking the King’s. Climbing up to the top of the trash chute, the Captain peered into a large common room, where four additional ogres, two male and two female were performing various tasks, but in the far corner there was a nun keeping watch over a figure lying down. He swam back to Fang, reported his findings, and chose to try the underwater path to the south. This almost became the last act of Captain Chance, as the path to the south extended underwater for miles. When the captain finally realized this he remained calm, turned around, and swam against the current back to the opening from which he came. Despite nearly drowning, Captain Chance had no problem returning to the waste receptacle chamber so that he could sneak up and into the common room above. Lady Thana and Fangzhi put their weapons away and decided to approach the ogres in the common room in a peaceful manner, hands outstretched to show that they weren’t armed. When they entered the large chamber the ogres were immediately shocked, especially considering that they did not hear anyone skulking about the abandoned temple. Lady Thana started speaking in a careful and polite tone to keep the ogres at bay but her words were not necessary for before the brutes could react Sister Evangeline ran towards the party and begged for their assistance. Behind her, lying on the ground, was an injured martian! “Who’s our sneaky person? Oh, it’s me!” - Frank came to the realization that he was exactly what the party needed. “Are they full of chili?” - Jen was listening in to the game and was wondering what the barrels from the S.S. Stag were filled with. “I see a giant spider, and I shoot!” - Craig joked, as his character Nigel was looking at some old webs that he knew Frank’s character Fang was hiding behind. “I doubt you’d kill Dante. 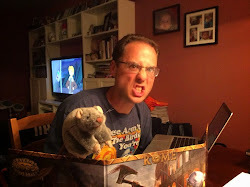 It’s a risk I’m willing to take!” - Frank, just before the GM almost killed Dante’s character. A billion years beyond "once upon a time" the Three Princesses of Nihliesh were poking about in Lowport looking for Nemo's Bar and Pub, where they hoped to find Mr. Gibbs. Commodore Jek Sperro was absolutely sure that Gibbs would be able to help him find his way to the Oracle Jruve near the coast-line of Ancuan, as the two had worked together in the past. Eventually the party found the bar that they were looking for, but it was an incredibly raucous site. Inside the building there were dozens and dozens of pirates, each dressed in shark-leather and wearing bits and pieces of coral, metal, and other jewelry. Also inside was the insidious Captain Rook, a large cybernetic looking man with a metal chest and a pair of metallic hands. Near the captain, laughing at his jokes and drinking several bottles of grog all at once was Mr. Smee, Captain Rook's octopus assistant. The bar was packed, and it looked like there was no way to get in, save for the fact that there was a signup out front for Karaoke Sing-off's. The squirrelly looking man who was writing down names told the princesses that if they wanted to enter, they would have to take part in the sing-off themselves, and be paired up against the meanest, baddest singers in all of the City of Bridges or Ghan. Merida was the first to sing-off, and she was facing Mr. Smee, a brown and orange sentient octopus who was never far from his metallic lord. As was the custom, a silvery light appeared above the princess's head, created by an artifact that was built into the stage at Nemo's. The silver apparition probed Merida's mind, and then instructed her that she was to sing a song about Olaf the cryo-mutant. Merida was able to rhyme about 40 seconds worth of beautiful song, in sort of a hip-hop fashion, spinning a tale about her pal and how he was in love with Bel back in Nihliesh. At the end of the song, it was so amazing that Mr. Smee couldn't even muster a word out of his beak, and Merida was declared the winner. Next the light was flashed over Anna's head. The Nihlieshan princess was told that she was to sing about her home… Nihliesh. This was easy for the princess, and so her tune started out soft and pleasant, telling of the beauty and happiness in her home. Her opponent was none other than Mr. Gibbs himself, a cat-faced abhuman, who figured that since he was the coordinator of the event he had this all in the bag. But then Anna changed keys and started a dance beat, shouting a "baby" here and a "baby" there. She wailed for over a minute, only stopping when she couldn't figure out another word to say rather than "baby." Mr. Gibbs was shocked. He had never heard anything quite like it, and he too bowed out of the competition, bested by one of the greatest singing voices he ever heard. It was finally up to Elsa to finish the trio's conquest of Nemo's. But the graceful nano was singing against Captain Rook himself! The loud and evil man who fused flesh with steel glared into the eyes of Elsa as she started to dance. The silvery light commanded her to sing about the war-moth encounter, and not only did Elsa sing out loudly about the moths, but she started to fashion moths out of ice and snow, and as the song progressed she threw them out and into the audience, much to their delight. Captain Rook didn't even get a chance to go up and sing… the audience was clapping so loudly that they proclaimed Elsa the winner before she could finish. Mr. Gibbs paid each of the princesses 100 shins for winning the sing-off competition. Merida asked if they could go outside so that Commodore Jek Sperro could be involved in the conversation, to which Mr. Gibbs agreed. Sperro and Gibbs drafted a quick plan to use the knowledge and maps that the navigator had to help the commodore reach the Oracle Jruve far south of the Sea Kingdom of Ghan. But there came a warning from Gibbs: Captain Rook had been made to look quite foolish by the rest of the City of Bridges' pirates during the sing-off… he would be coming for the party once they reached the high seas. "How is there an eyepatch made of metal? Wouldn't it fall off his face?" - Evie was having a hard time with the GM's descriptions. "I'm just thinking of L.A. Noire and that bar in the game." - Maybe I'm letting Carrie spend too much time watching me play on the PC. "I had a friend who loved a belle and Olaf was his name-o!" - A verse from Merida's song about Olaf. "Nihliesh was where I was born… Nihliesh was so great and tall!" - A verse from Anna's song about Nihliesh. "There were war-moths, one's name was Swirley, one's name was RPG!" - A verse from Elsa's song about the War Moth encounter. "I feel like I'm at a Devo concert." - The wife was just shaking her head at the girls' singing. Across the Sere Marica there is a place of riches and magnificence, a town where the lowest of the low can gain the greatest wealth imaginable. All that is necessary is for those of low class and poor circumstances to show some initiative, cross the salty sea, and sign a two-year work-to-live contract with the city of Queslin, where the salt runs free. It was this carrot of hope that called out to young Eisen and Berelle of Nihliesh, twin children of a well-to-do merchant-prince, causing them to flee home and city-state to make the dangerous journey on their own. For members of the Broken Mask, a bounty-hunter’s guild located within and operating out of Nihliesh, a pair of missing noble children meant shins in the pocket. Dalroc, Rhodes, Daylen, Reminal, Strom, and Dezra made the long trek, tracking the children from Matheunis to Seshar and finally across the Sere Marica. On a wave cutting dagger named the Brinefisher the six bounty-hunters crossed the briny sea. Their vessel was commanded by Waylen, a copper skinned man whose flesh barely hung to his bones. The only other passengers on the water-craft were two stoic gentlemen that sat relatively still across from the characters. As the vessel approached the Queslin docks, Reminal started to put his focus to work. He connected with the force projection sails that propelled the ship across the waves. Judging by how often the sails were used, and the manner in which they were unfurled, Reminal was able to use his extreme intellect to work out that the Brinefisher had been making this particular journey regularly for about eighteen months. Gaining the assistance of Dalroc and Rhodes, Reminal was able to benefit from a hedge-magic induced distraction to scan the two other passengers. These two were soldiers or guards of some kind, outfitted nearly identically. They were either guarding something, or getting ready to guard something. When the Brinefisher docked, immediately the two on board began assisting two similarly dressed individuals in loading jar after jar onto the craft, each weighing in at 25-30lbs. Rather than crack one open and gain the ill-desired attention of the guards, Daylen used his x-ray vision cypher to see the contents of these jars. Large clay jars full of leeches. With each jar being loaded the party could see that Waylen was becoming more and more visibly upset. Something about these jars was off-putting to the sailor, something “more” than them just containing leeches. As the characters disembarked from the craft they were quickly approached by a rotund merchant-looking fellow. He swiftly approached Strom and started to ask question after question, probing the characters in their intent and guiding them towards setting their eyes on Queslin itself, a city that existed south of the docks, just over a large sandy hill. Well the bounty-hunters had ideas of their own. Ignoring the requests of Omaru, the characters fanned out a bit to probe the area surrounding the dock. Rhodes had ignored the large dignitary almost immediately, entering the small building that Omaru had emerged from initially. There was little in the building, but the jack did find some contract forms, so he quickly crumpled one and pocketed it for later. Omaru continued to try and convince the characters to sign on to Queslin’s “work-to-live”, and was becoming visually frustrated that no one was buying in. The ambassador clicked some kind of device in is pocket, and some of the aneen-mounted guards from the camp’s periphery began moving closer to the docks. Realizing that they were only going to find out what happened to Eisen and Berelle if they visited Queslin, the party agreed to follow Omaru to the great city of which he spoke. Most of the bounty-hunters did as directed and walked on the perfectly straight path that connected the port to the city, and with each step they became more and more interested in the prospect of Queslin’s work-to-live program. Something in the salty trail was interacting with their minds. Figuring that something like this was possible, Reminal would have nothing of the path itself. Carefully he walked along the edge of the path, not allowing his feet to step on the brighter colored sand. He of course was not affected by the mind-altering trail. As they approached the walls of Queslin, the bounty-hunters were pleased by a welcoming sight. The city, surrounded in walls, was comprised of a large, “J” shaped district covered in a shimmering glow emanating from a large obelisk. In the north-west corner there was a walled fortification, surrounded by a moat made of purple liquid. Omaru was careful to warn the party to stay away from the edge of the trail as they entered, for slurges, trash eating dire snails, were known to spit their acidic mucous at those fell towards the liquid below. Once in town, Omaru handed the party off to Nilia. Unlike Omaru’s hard sell, Nilia had a softer tactic. She explained to the party that the work-to-live program was a difficult two years of toil in which those that signed up were indentured servants to the city. She would not explain what the work itself consisted of. When questioned about Eisen and Berelle Nilia was very open with the bounty-hunters. Both children had signed on with the work-to-live program, and were already bound to the city. Because of the nature of their contracts, Nilia could not allow anyone from the party to speak with the two youths. When it appeared obvious that the party-members weren’t going to join the program, Nilia explained that they had until nightfall to purchase anything they needed at the merchant’s stall, but then they needed to leave the town. While most of the bounty-hunters were speaking with the administrator, Rhodes took a peek at the operations, specifically those related to the leeches. In the east of the small fortification, there were tubes connecting to the larger portion of the city, and from these tubes every three or four minutes a pot of these leeches popped out to be stacked and ready for delivery to... somewhere. Where these leeches were coming from no one was letting on, nor their importance. The merchant’s stall was less informative, but it gave Rhodes a chance to tell the rest of the party about his discoveries, and show them the contract. After deflecting the merchant’s request to “sign them in” to the work-to-live program himself (it seemed like everyone was in on this deal), Rhodes turned his back to the merchant and uncrumpled the contract. The words were clear, they bound the signer to a two year program where the city itself owned them. But it would be the filaments sticking out of the paper that were the most interesting. When brought back to the nano’s of the party, they deduced that each contract was a cypher, and if activated, it connected to the neural network within the mind of the user, rendering him or her incredibly susceptible to mind control while allowing them to remain fully aware of their surroundings. Some kind of device would be necessary to activate the cypher, and the party further figured that the “pen” that was used to sign was most likely this artifact. To further reconnoiter the walled-fortification adjacent to the town, Strom decided to climb the large tower along the edge and see what he could see on the inside. With a remote viewing cypher affixed to his noggin, the cyborg stealthily ascended the side of the tower until a window was within view. Inside was Overseer Brandle, and he was discussing the party with Omaru. The Overseer did not seem happy that the bounty-hunters had not signed on to the program yet, and was commanding Omaru to have them murdered as soon as they left town, most likely by the aneen-riders and their lances. At the center of the overseer’s command station were multiple view screens that must have controlled most of the town. These would become the main target of the upcoming operation. Strom left part of the remote viewer behind, and quickly scaled back down the side of the tower, pulling the party together. Within a few minutes a plan was put together to infiltrate the Overseer’s command station. The six bounty-hunters entered Nilia’s welcome station and said that they were ready to sign on to the agreement. Each was placed in a special chair (which was designed to keep the signer propped up after using the cypher-paper), and given a pen to sign the contract. Reminal remotely de-activated the pen before it could be used, and as each bounty-hunter started to sign the paper they acted as if they fell unconscious. Once all six were pretending to be out cold, Nilia called for two guards to bring two sets of triple-bunk gurneys. One by one the party-members were loaded onto the gurneys. When the guards reached Dezra, however, the mechanical nano reached out and gave a terrific shocking grasp to poor soul, cooking him from the inside out immediately as electricity coursed through his brain. Strom struck another with his metal fists, but the guard was still standing, despite being in a lot of pain. While Nilia looked on in horror, Dalroc stood up and tossed his corrosive gas bomb at her, causing her to dissolve into a puddle, all while screaming and gasping for air. The second guard was quickly dispatched while the party awaited more guards to pour into the welcome chamber. But the guards never came. There seemed to be some kind of sound dampening in this room, the reason of which the party wasn’t sure of. Still motivated to move quickly forward in their plan Rhodes went out of phase and climbed the stairwell towards the Overseer’s chamber. Sticking his head through the door, Rhodes saw that Brandle’s back was to him, and took the opportunity to charge into the room and backstab the Overseer. Groaning the Overseer turned and tried to touch his sleep inducing ring to the clever jack, but Rhodes was too fast and he grabbed the hand that held the ring. Alone and knowing that the rest of the party probably couldn’t hear the scuffle, Rhodes took his sword and stuck it straight in the belly of the Overseer, causing him to slump to his death. The jack put the Overseer’s body on the floor, moved downstairs, and called for the nanos to come up and help explore the chambers. Once upstairs the bounty-hunters shifted gears and started loot-grabbing. The Overseer still had his sleep inducing ring, and a vicious saber strapped to his back that was both extremely easy to use as well as being extremely deadly. The control panels could’ve easily been raided for cyphers but Reminal and Dezra had other plans. Dezra started manipulating the panels to gain access to the rest of the facility’s controls while Reminal connected his mind directly to the controls. The shock to Reminal’s mind was rather painful, but due to an unexpectedly incredible success, the graceful nano managed to completely bypass any kind of firewall that existed within the obelisk itself. Reminal had full control of the facility’s electronic systems. This also meant that Reminal started to understand the big picture of what this facility truly was. Millennia ago Queslin was probably some advanced salt mining facility, although based on the layout it could’ve been set up to mine any other kind of material that existed below the ground. But now it was something... different. The obelisk was a masking device, a camouflage generator that projected the image of a bustling city, but in reality was covering a large production area and living quarters for the “slavers” that ruled here. There was a single mine shaft that stretched into the ground below, and it was at the bottom of this mineshaft that the truth of Queslin came out. At the base of the shaft was a large chamber. A honeycombed structure held roughly 4,000 bound living humans, their mouths stuffed with black tubes that led to a massive feeding machine. Great mechanical beetles mined the salt below Queslin, bringing it to the machine, where the salt was mixed with water, some basic fats, and an oat powder. This “saltfeed” was then force-fed to the trussed slaves. On the other side of the honeycomb a worker took small leeches, buckets of them, and distributed them throughout the honeycomb. These leeches were covering each bound member of the “work to live” program, feeding off of their bodies, and becoming salty and plump in the process. Most of the party didn’t know why this would be a business at all... who could be profiting from salt filled leeches? But when Rhodes put the facts together he retched into his mouth. The clever jack had been part of a well-to-do family, and remembered in his past eating tasty little “escargot” type salted creatures. Perfectly brined, perfectly tasty, these exotic morsels were extremely hard to come by. Because they could only be found in Queslin. And there were precious few who survived the work-to-live program apparently, their boat-captain Waylen being only one of six on record in the Overseer’s office. Realizing that they only had a little while until someone would come inside the tower and realize that both Nilia and the Overseer were dead the bounty-hunters quickly concocted a plan and started to move with a near-military style precision. Rhodes and Daylen put on the guard uniforms and Dezra, Dalroc, and Strom hid themselves on a triple-decker gurney. Since he was still hacked into the system Reminal stayed in the command station so that he could control the elevator, lighting, and even the Obelisk itself if the need arose. Rhodes and Daylen talked their way past the initial guards, got in the elevator shaft, and descended into hell. At the bottom of the mineshaft a fishy smell washed over the team, nearly causing them to gag. Swiftly Rhodes and Daylen pushed the gurney to the honeycombed structure, right up to one of the workers who was holding a remote control. The worker had given Rhodes a number corresponding to the row and column in which to place the three “salteaters” that were to be placed inside the machine. Once they got close to the worker however he started to realize that they weren’t slavers themselves. So Daylen tipped the gurney causing a significant distraction, and also giving the rest of the party time to get ready for a fight and subsequent flight. Quickly Rhodes put the worker to sleep, and the team started unloading the two twins (their names had been found in the records earlier) from the honeycomb. Strom was placing the twins on the gurney when one of the other workers approached, questioning why there was a salteater discharge that day. In an epic “taste of your own medicine” scene, Strom took one of the leeches off of Eisen and shoved it in the worker’s mouth, causing him to fall to his knees gagging. Most likely he would’ve died from the leech, as he was unable to retrieve it from his mouth, but then Dalroc, sickened by the amount of pain and suffering that was going on around him, pulled a dagger and started stabbing the worker repeatedly until he was dead. To cause a distraction for the rest of the workers in the mine, Reminal at this time started flashing the lights in the cave, which allowed the team to get back to the mineshaft. Once at ground level Reminal turned the lights out in the lower level and shut off the mineshaft. Those that were down there would remain, entombed with the poor souls stuck in the salt-feeder machine. The graceful nano cranked the salt-feed mechanism as well, drowning the nearly 4,000 salteaters within moments. A brutal death, but a kindness in the Ninth World for those who could not be saved. At the top of the mineshaft the doors opened and the A-team sprang into action. Rhodes flashbombed the one aneen riding guard, nearly killing both animal and rider but blinding both for several minutes. Strom placed a monofilament blade on his finger and cut down another guard while Dalroc hacked away at another. Reminal manipulated the production line for the leeches remotely, causing a blackflow and spillage that sickened some of the workers. Although a few workers tried lobbing daggers at the party, they were basically unsuccessful in injuring Strom, who’s metal body repulsed light weapons entirely. Those that were not cut down fled the scene. Strom threw the twins on top of the aneen and the party started riding out into the night. But before the team could leave Queslin, there was one lone figure blocking their way. A sniveling and whining Omaru stood before them, nearly crying with fear. Despite a last minute attempt to be witty and charming to the Broken Mask bounty-hunters Rhodes simply pulled out his crank crossbow and shot the man. While he fell to his knees clutching the bolt, Daylen pulled his bow and started firing as well. Queslin was dead, the salt... and leeches... never to flow again.